‘Stoic’ is the term used by TV anchors to describe Japanese behaviour during their current national disaster, though it is probably not apt because the Japanese reaction is not derived from the Greeks but is particularly Japanese and very much an Asian characteristic. Scholars have been engaged in an unending debate on how culture does or does not influence national behaviour. This has led to seminal works such as Jack Snyder’s The Soviet Strategic Culture: Implications for Limited Nuclear Operations(RAND, 1977), and Kenneth Booth’s Strategy and Ethnocentrism (1979). George Tanham, in his work on India, found that present-day Indian policy makers lacked awareness about strategic culture. Samuel Huntington perceived a pattern of a future clash of civilisations, and famously (or infamously) concluded that Islam has bloody borders. Max Singer, writing in Strategic Analysis in 2010, suggested that Iraqis are a brutal and violent people. Lynn P. Nyggard, who examined academic writing from a cultural perspective, found that in the Anglo-Saxon tradition the writer’s job is to be clear; in the Francophone tradition it is the reader’s job to figure out what the writer is saying; and in the Asian tradition (on the basis of Chinese data), the student’s job is to faithfully reflect the teaching of the instructor. The current controversial - and for some, flawed - military practice followed by the US in Afghanistan has gone to the extent of weaponising anthropology by using anthropologists to study and understand ethnic and tribal behaviour through “The Human Terrain Project”. While the study of culture will continue unabated, one aspect that stands out is the laudable behaviour of the Japanese people during their current national disaster. ‘Stoic’ is the term used by TV anchors to describe Japanese behaviour, though it is probably not apt because the Japanese reaction is not derived from the Greeks but is particularly Japanese and very much an Asian characteristic. The roots of their exemplary behaviour can be traced back to Shintoism, Buddhism and the Tenno system (by which the Japanese believe the Emperor to be the descendant of the Sun God and whose command is the word of God). Traits peculiar to the Japanese are: accepting a natural phenomenon with calmness; orderly private and public behaviour; fatalism; and doing one’s duty regardless of the circumstances. Given this, we have not seen any scenes of panic, hysteria or disorderly behaviour. 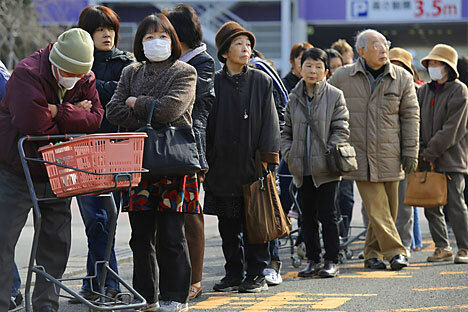 The Japanese parliament remained in session; train services resumed soon after the quake and commuters remained orderly. The duty-bound Japanese troops quickly swung into action and started rescue missions in affected areas with the help of local authorities soon after the incident. Even those working in the embattled Fukushima nuclear power plant persisted with their efforts to bring the situation under control. Disaster awareness has been institutionalised among the Japanese with drills on how to behave during emergency situations such as earthquakes and fires. Children are drilled to protect themselves in the event of natural disasters. Even foreigners intending to live for longer periods are taught how to respond in these situations. They go to ward offices where they participate in mock drills and are exposed to tremors of varying magnitudes in labs. Indians have also been analysed and studied by many Western scholars. These studies have been paradoxical and many layers of attitudes have been found among the Indian people. But one thing is clear: although Indians may share common Asian values with the Sinic or Japanese people, there is an absence of public discipline and a mob mentality emerges in panic situations. This is the result of a typically Indian, and to a large extent South Asian, characteristic of public rumours fostering hysteria and panic. Historian Indivar Kametkar, in his essay “The Shiver of 1942,” showed how rumours of an imagined Japanese invasion of Bengal, Orissa and Chennai during World War II led to panic and flight from the coastal regions. This rumour-mongering tendency gets further compounded by another national characteristic: Indians are also more superstitious than rational. No scientific evidence can dissuade the public from believing that idols drink milk or that sea water lapping the polluted Mumbai beaches is turning sweet and has medicinal properties. Disaster management is also a function of societal and cultural behaviour. While earthquake resistant buildings and the safety of dams and nuclear plants are important, orderly public behaviour under stress is also vital. There is an urgent need for India to prepare for disaster management. It is a fallacy to believe that Indians will always behave in an unruly manner. Public order can be maintained by enforcing discipline as was done during the 2010 Delhi Commonwealth Games or in the Delhi Metro. The Indian public responds to the enforcement of discipline. This is unfortunately perceived negatively as a danda and the chattering classes point to the example of the emergency when trains and other services ran on time. The key message is that culture matters and policy makers need to design polices and plans after taking national behaviour into account.